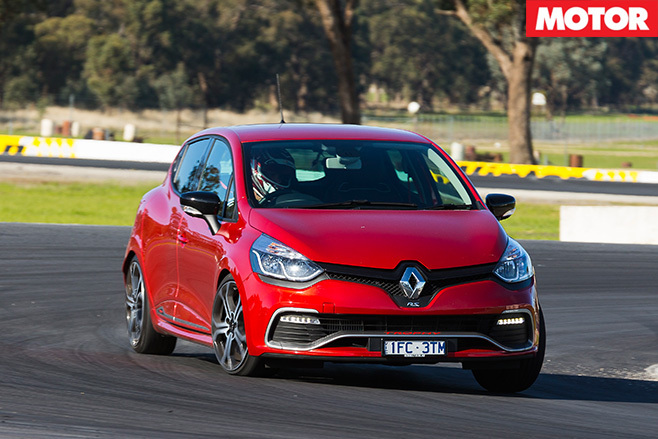 Car lovers and enthusiast media have widely panned the fourth-generation Renault Sport Clio for being not enough a chip off the old block. We speak about its three-door, nat-atmo predecessor with a glint in our eyes, because god, was it good. Not to say the new Clio RS is a dud – it’s a more useable, comfortable and probably better car – it’s just a bit boring by comparison. Credit to Renault for creating this, then: an update aimed at bringing more fun. The RS220 gets more poke (15kW/20Nm), quickened twin-clutch auto gearchanges, tweaked chassis to make it more lively, more aggro seats and even shorter travel on the column-mounted shift paddles. And on track, the changes absolutely make for a better mousetrap. The engine is still hardly a cracker, but the tweaks add some pep regardless. Roaring out of pit lane, the engine note is a loud whooshing sound mixed in with speaker engine noise. Interesting, but you wouldn’t call your mates over to tell them about it. But it immediately feels stronger and more energetic, to the point traction is just starting to become an issue. The gearchanges are noticeably faster, too, in a welcome way, with a nice twin-clutch exhaust pop on upchanges. 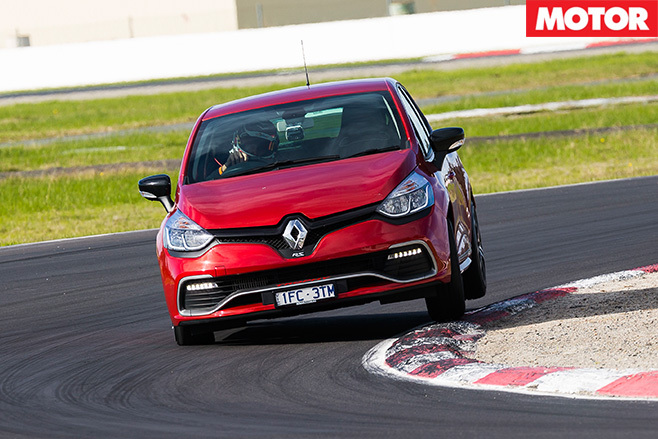 The chassis changes have made it an even bigger laugh on-track, more lift-off oversteer-y than the ‘regular’ Renault Sport Clios. Back it in all day, now a little easier, too, thanks to a poofteenth-quicker steering rack. Renault Sport still knows how to do a chassis, clearly. The changes seemed to translate to speed on track, too. Keeping the quicker surface in mind, the RS220 posted a respectable 1:42sec lap – 3.4sec quicker than last year’s RS200, 1.3sec quicker than the Polo GTI and a whopping three seconds quicker than the Fiesta ST, two cars it could count as rivals. But still it was pipped by the VW Golf GTI, a car just $1000 more expensive. 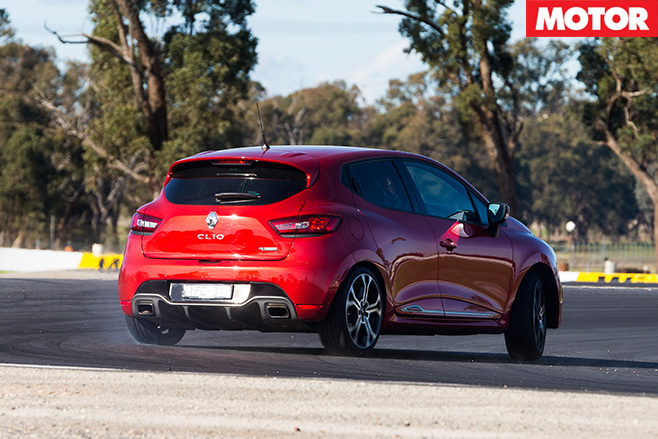 And that’s where the Clio starts falling down: it’s also the most expensive fourth-gen Clio RS so far. Sure, its $39,000 gets you a lot of equipment, but it’s big money for a Fiesta-sized car and really put paid to the Clio RS220’s hopes of a repeat win. Remembering its $29K, lower-spec sibling won the $0-$50K class at Bang For Your Bucks 2014. The numbers tell the performance story of lots of grip – quickest in class, in fact, through Turn Nine (probably no small thanks to those pricey-but-sticky Michelin Pilot Super Sports) – but not quite enough grunt nor brakes. Fast, and an entertaining handler, but for $39K, not fast enough. 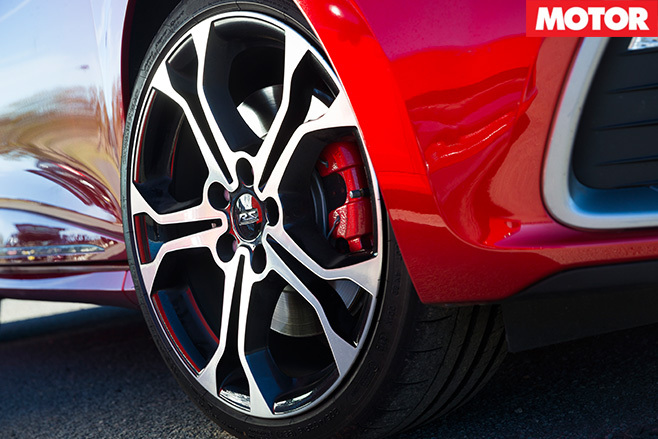 “Like the Fiesta ST, you can back-off and have that old school hot hatch lift-off oversteer. “The engine is really good, but the gearing is probably not well suited for this circuit. Also with the shift paddles staying on the steering column and not following the steering wheel, you’re coming off some of the second gear corners and trying to find where the lever is – but that’s probably more circuit specific to Winton. Want more? Check out the rest of 2016 Bang For Your Bucks.